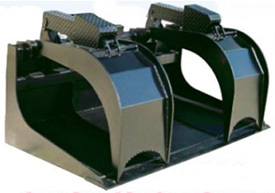 Demolition Grade Root Buckets for Skid-Steer Loaders move bulky hard-to-handle materials easily and securely. It is the best choice for clean-up of demolition and storm debris. Hydraulic cylinders operate independently to adjust for uneven loads. NOTE: Demolition Grade is especially recommended for "Track" Style Skid-Steers and those with 70 HP or 3500 lb capacity or larger. Specs: grapple opening 45"; depth 39"; back height 21"; back structure (2) 4"x4"x1/4" tubes; bucket back 3/16" plate; bucket bottom 1/4" plate; bucket sides 1/2"; bottom wear protection 1/2" ribs; grapple thickness 9/16". See table below for more Specs. Available options are Bolt-on-Blade and Bolt-on End Plates.